Anyways, so my dad, Craig (pictured here) happens to be a heterosexual male, well into his 60’s, is a decorated veteran of the Marine Corps, served in Vietnam, drives giant Harley Davidson motorcycles, cusses like…well, like a Marine, and also is the most mischievous person on the planet. Thanks to him I was actually kicked out of a Las Vegas hotel like a boss when I was still in middle school. How? He was teaching me to throw paper airplanes in the Luxor Hotel’s atrium! Obviously he had to be Snow White for Halloween! I made fancy light blue princess sleeves for a regular dark blue t-shirt, he commandeered my skirt, we added my wig and my cape and it was a done deal! Of course he wouldn’t shave his handlebar mustache, so yeah, that happened… He ended up not just wearing the costume on Halloween night, but also to get kicked out of both Disneyland AND Disney World for sporting it in the parks. That’s right. In the name of mischief he got himself kicked out of The Happiest Place on Earth. Twice. That take’s commitment. 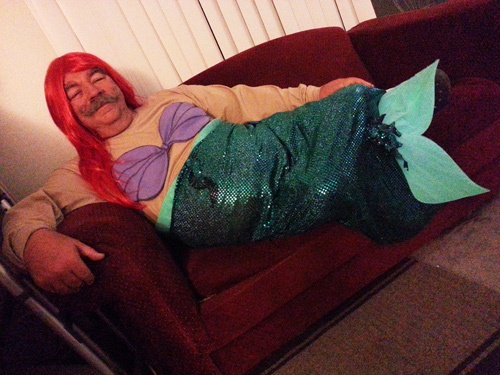 At first we were ambitious and swore to do a different Disney Princess costume for him every year…but you know, things happen and we got sidetracked. We did make him a full Cinderella costume, which he wore very well, but once me and my wig collection moved out on my own, I’m not sure if he’s worn it since. 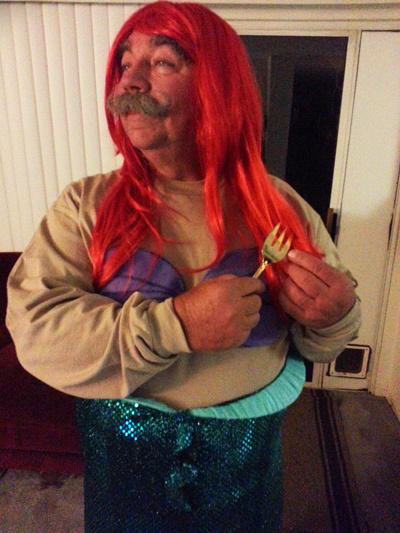 This year, we bought his very own bright red “Ariel” wig and it is game on! You’re welcome. That is totally awesome JoJo! We have pictures of my Dad wearing my Mom’s bra when he was much younger. My Mom was pissed, but we all thought it was the greatest thing ever. It is a big family joke now and we try to best each other who can buy him the most over the top bra (I won’t mention what we do with underwear). Of course, he is always more than willing to model it for everyone~ Hairy chest and all. Good times right there.